There are things we do every day that we look back on and regret. Or, at the very least, wish we would have done a little differently. It could be anything: how you responded to an email, the way you phrased something, how it looked when you walked across the room, what you wore, how you sneezed, the way that pasta made your breath smell, etc. The point is that as human beings, we consciously notice these things. We notice things that make us seem unkempt, unwise, or unsanitary. In other words, we actively have a tendency to notice things that appear unprofessional. And unfortunately, there are certain habits that are impossible to recover from. Basically, if you do the following things, “you” and “professional” will never again be used in the same sentence. So read on and take notes so that you’ll never be “that person” in the office. Here are the four categories that will get you to that point of no return. Is there a desk underneath all of that? 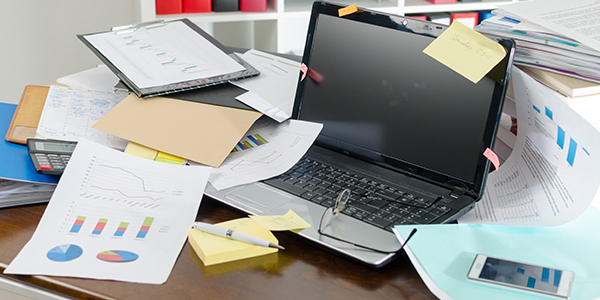 When someone’s workstation looks like a mess, they’re suddenly a mess, too. It doesn’t matter how many showers you take, how expensive your clothes are or where you get your hair cut, you will always be associated with a messy workspace. And, to a certain degree, it’s true. Your physical appearance may be mess-free. But, if your home, car, desk or drawers are filthy, a part of you is messy, sloppy, unkempt and not fit to do business with. This doesn’t mean your environment has to be 100% clean, 100% of the time. It simply means you need to do your best to stay on top of the seas of junk, clutter, and wrappers. There’s nothing worse than garbage tucked into drawers and behind files, especially when the smell starts to permeate. Here’s another way to think about it: if a client walked by or a vendor showed up, would they be embarrassed to associate with you? Please, be serious for once. We have all encountered that work colleague that can never be serious. They are always making jokes and you can never get a solid answer from them, even with a deadline approaching. And the more you ask them to be serious, the more they act goofy and silly. Why does this behavior drive normal people insane? Well, because in a business context, this level of silly is annoying and unrealistic. Don’t get us wrong, keeping others in a good mood has its place and time, and a happy work environment is always a good thing. But when tasks fall behind or you cannot be productive with those goofy people, their personality becomes more of a headache than a ray of sunshine. Professionalism requires a healthy balance of optimism and pessimism, ideally sitting in the realism range. Always joking and never taking anything seriously will only make the bad times worse and frustrate other employees. Are you too good to put in your eight hours? Some of us are morning people and some of us are not. Depending on your chronotype, you biologically function differently than other people. Some of us hit our stride in the mid-afternoon, while others get things done most effectively in the morning. Regardless, whether you come in an hour early or happen to come in late, always stay for your eight hours. If you work a traditional job and you drag in late day after day and pack up at 4:45, your coworkers will probably start to feel very resentful toward you. And it shows management that you don’t take your job or responsibilities seriously. So instead, if you know you aren’t a morning person, talk to your manager or an executive and see if you can adjust your work schedule. As long as you’re getting your work done efficiently and productively, it shouldn’t matter when your eight hours begins and ends. Can you follow through on anything… ever? People-pleasers are on the same level as those goofy colleagues. People-pleasers say yes, yes, yes and never say no to anything. Translation into plain English? They overpromise. They’re in way over their head. They can’t deliver because there’s never enough time in the day. Further translation? They commonly let peers down, are no real help and ultimately, unprofessional. Always make sure to have your work tasks scheduled as best as possible so you can say no when you need to. And never be afraid to ask for help.